Executive compensation has always been a highly controversial topic. Shareholders of public companies have often been critical of pay packages that appear to have little connection to underlying business performance while politicians and activists have criticized high executive pay in the context of overall social cohesion and income distribution. While the motives of the critics may differ, the decibel level of the opposition rises exponentially whenever news of a giant pay package appears in the media. When you mix politics associated with a presidential transition into the discussion, the outrage becomes even more intense. Several of President Donald Trump’s high level appointees are from the business community and have chosen to leave highly paid positions in order to serve in the administration. Government ethics rules typically mandate that senior officials must be free from concentrated holdings in companies that they will be in a position to influence. As a result, not only are these executives leaving their position in business but they must simultaneously divest themselves from “conflicts of interest”, as defined by the ethics rules. When a highly paid executive leaves his or her position, the process of untangling financial ties is very complicated because compensation typically involves various forms of equity in addition to cash. Most companies employ compensation consultants to put in place systems that are supposed to align the long term interests of shareholders with equity-based compensation for executives. Gary Cohn was named as the Director of the National Economic Council in December and subsequently left his position as President and Chief Operating Officer of Goldman Sachs. Earlier this week, Goldman released details of Mr. Cohn’s exit package which was also widely reported in the media. The “headline news” is that Mr. Cohn is receiving more than $100 million as he transitions from his 25 year career at Goldman to government service. However, we need to spend a little time digging beneath the surface to understand the nature of Mr. Cohn’s exit package, whether it was justified from the perspective of Goldman shareholders, and whether the outcome actually results in the elimination of potential conflicts of interest. As always, it is better to go to the primary source materials rather than to rely on news accounts alone. Goldman filed an 8-K with the Securities and Exchange Commission on January 24 providing full details of Mr. Cohn’s exit package. A summary of the key points decided by a special committee of Goldman’s Board of Directors appears below. Mr. Cohn’s total compensation for 2016 was $20 million, of which $1.85 million represented base salary and $18.15 million represented variable compensation. Thirty percent of the $18.15 million variable compensation, or $5.4 million, was paid in cash while the rest was paid in the form of 54,903 restricted stock units (RSUs) based on Goldman’s closing stock price on January 19. According to Goldman’s 2016 proxy statement, RSUs are generally delivered over a three year period following the RSU grant. However, as we note below in more detail, Mr. Cohn’s RSU grant for 2016 was not subject to the normal three year delivery schedule. The purpose of Goldman’s RSU program is ostensibly to promote an ownership mindset among executives and to encourage long term thinking. For this reason, RSUs are delivered over three years following a grant of shares and there is a five year transfer restriction in place from the date of the RSU grant. Additionally, the proxy specifies that claw back provisions apply to RSU grants which can result in forfeiture of equity based awards. According to the 8-K, federal ethics laws require that Mr. Cohn divest all holdings of Goldman stock, including RSUs. In addition to the 54,903 RSUs granted to Mr. Cohn for 2016, he owned 96,572 RSUs from prior year grants as well as 99,909 shares of common stock which remained subject to the five year transfer restriction. Of the RSUs outstanding, shares were scheduled to be delivered at various dates between January 2017 and January 2020. Transfer restrictions on outstanding awards and shares were scheduled to be released between January 2017 and January 2022. Due to Mr. Cohn’s departure for government service, all awards were delivered immediately and all transfer restrictions were cancelled. On January 23, Mr. Cohn received delivery of the shares of common stock underlying all outstanding RSUs, less shares withheld for applicable taxes, and all transfer restrictions were removed. This allowed Mr. Cohn to divest himself of all of these shares along with freely transferable shares of common stock that he already owned. Based on Goldman’s closing price on January 23, the proceeds from the RSUs awarded for 2016, previously granted RSUs, and shares of common stock previously subject to transfer restrictions was approximately $58.5 million. Mr. Cohn also divested additional freely transferable shares that he owned, but those shares could already have been sold previously at any time without Goldman’s board taking action. In addition to cash and RSUs, Goldman executives are provided with long term incentives and performance based restricted stock (PSUs) that are ostensibly designed to provide even more alignment between executives and shareholders. According to the company’s 2016 proxy statement, PSUs are tied to specific pre-established performance metrics (primarily the firm’s average return on equity over a three year rolling period) and represent one-half of annual equity based variable compensation. Long term incentive program (LTIP) awards have an expected eight year performance period where the payout is based on average return on equity and average change in book value per share. According to the 8-K, Mr. Cohn had historical performance-based cash awards under the LTIP plan granted each year from January 2011 to January 2016, along with PSUs awarded as part of his 2014 and 2015 compensation. These awards were already fully vested and would have remained outstanding had Mr. Cohn retired, after which point they would have paid out according to the original terms of the awards (as performance targets are hit or missed). However, federal ethics rules prohibit Mr. Cohn from continuing to hold these awards while employed by the government. Accordingly, Goldman shortened the performance period for both the LTIP and PSU awards to end on December 31, 2016. The grant of 76,394 PSUs was settled with cash payment to Mr. Cohn of approximately $18 million while the LTIP award was settled via cash payment of $47 million. 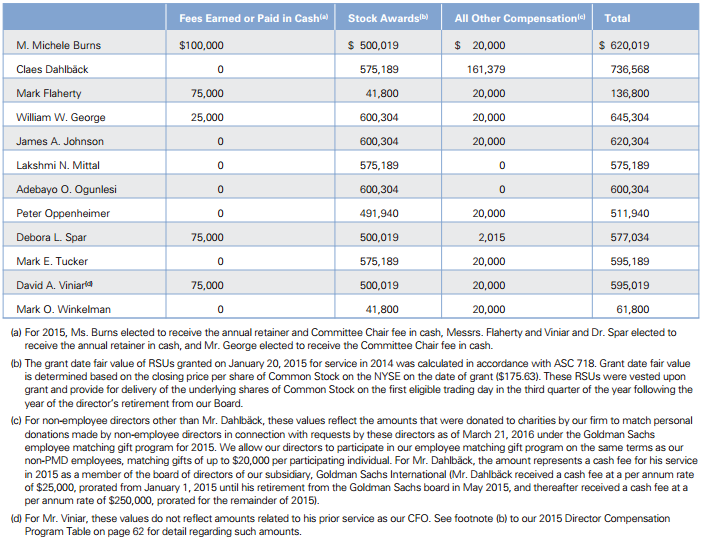 It is important to note that the total of $65 million paid to Mr. Cohn under these programs represent certain cash in his pocket today versus variable compensation that would depend on Goldman’s future performance. Depending on the reporter covering the story, the value of Mr. Cohn’s “exit package” can be different because some calculations appear to include awards and stock that have already vested and others do not. We must make an effort to fairly consider what the true “exit package” is versus liquidation of shares that Mr. Cohn already owned outright. We cannot merely take the sum of all cash that is going into his pocket and call that his “exit package”. What shareholders and the general public should care about is the degree to which Mr. Cohn benefited from his decision to leave Goldman Sachs at this time in order to serve in government. We would suggest thinking about the value of the exit package by considering the value granted by Goldman’s board that Mr. Cohn was not contractually entitled to prior to his decision to leave the firm. Since Mr. Cohn served as President and Chief Operating Officer of Goldman throughout 2016, his base salary for that year clearly isn’t part of the exit package. He would have earned that cash regardless of his decision to leave. The same is true of the $5.4 million in variable compensation paid in cash. The 54,903 RSUs representing variable compensation for 2016 were fully vested but normally would have been delivered over a three year period ending in January 2020. Instead, they were delivered immediately and liquidated. Had Mr. Cohn retired from Goldman and not joined the government, he would not have been entitled to receive these funds immediately and transfer restrictions would have applied. There is no way to know what the value of Goldman shares will be over the next three years or at the time these shares would have ultimately been sold. Therefore, we would view the majority of the value of these RSUs, worth $12.7 million as of January 23, to be part of Mr. Cohn’s exit package. The 96,572 RSUs applicable to prior years’ compensation but still subject to transfer restrictions were liquidated for about $22.4 million, based on Goldman’s stock price on January 23. Had Mr. Cohn retired but not joined the government, he would not have been able to immediately sell these shares and they would have been subject to clawback provisions. As is the case with the 2016 RSUs discussed above, we cannot know the ultimate proceeds that Mr. Cohn would have received. The fact that he was able to dispose of these shares immediately has value, but we cannot specify that value in advance since we do not know what Goldman’s share price will be when those RSUs would have been originally available for sale. The PSU and LTIP awards seem to be more clearly defined as part of the exit package. While it is true that the awards would have remained outstanding and paid out over time had Mr. Cohn simply retired, these awards are subject to return on equity and book value per share performance metrics that we cannot possibly know in advance. These incentives were provided to Mr. Cohn to align his interests with shareholders, and those interests are no longer aligned given the cash payout worth approximately $65 million in total. Therefore, we consider the vast majority of this sum to be part of the exit package. Rather than pay taxes on the required sales of the investments, using the purchase price of the original assets as the cost basis, incoming members of the administration likely will be able to take advantage of a policy allowing them to defer paying taxes on the proceeds as long as they are reinvested within 60 days in government securities or mutual funds approved by the government. If the officials later sell the new investments, they pay taxes on any gains that they accrued, dating back to the original investment. However, if they never sell the new investments, they pay no taxes at all. Effectively, appointees are able to convert highly concentrated holdings, such as Mr. Cohn’s exposure to Goldman Sachs, into an extremely diversified position on a tax deferred basis. This can be thought of as similar to what ordinary people can do within an IRA or other tax deferred investment account, albeit with far smaller sums. Ultimately, taxes will be due using the cost basis of the original asset, but that day may not come for decades, if ever. If the appointee holds these newly diversified assets until death, they will receive step-up basis treatment for heirs. Both the deferral itself and the opportunity to exit a concentrated position in favor of a diversified asset such an index fund are extremely valuable to appointees. The value is not the amount of the tax deferral but rather the present value of the tax that is deferred and the reduction in risk of the portfolio based on the opportunity to diversify. This defies precise quantification but the value is clearly considerable and could be thought of as part of the executive’s “exit package”, or perhaps his “welcome package” when joining the government. Executives in the United States are very well paid and this, in itself, is highly controversial for many reasons. However, we must attempt to distinguish between the wealth and current pay earned by executives over a period of many years and the value of “exit packages” that they are given when leaving a company. When an executive joins the federal government in high level roles, the value of the tax deferral must also be considered. We should resist the populist appeal to sum up the grand total of all cash an executive receives and calling that an “exit package” without carefully examining the components. What motivates an executive to give up a position in industry to join the government? Perhaps idealism and a desire to serve is the reason and we must not be so cynical as to completely discount that possibility. However, it would also be unrealistic to think that financial incentives do not play a role. From an executive’s standpoint, particularly one who is close to retirement anyway, the opportunity to receive incremental cash compensation and to defer taxes while diversifying his portfolio has to be a significant consideration. We want good people to serve in government, but we do not necessarily want to provide perverse incentives for executives to seek out a couple of years of employment with the government as a career capstone in order to reap enormous rewards. Keep in mind that being a director at a public company is not a full time job, or anywhere close to it, yet these directors are paid in excess of half a million dollars annually. The nature of boardroom culture, as explained by Warren Buffett and others on many occasions, is that a director isn’t going to want to rock the boat or create confrontation. That is especially true if compensation is a large amount in absolute terms, or in relative terms based on the director’s other sources of income. The principle of reciprocity also exists here – directors may not want to take a hard line on executive pay especially when the Chairman and CEO roles are not separated. Although Goldman directors receive significant equity awards, being given compensation in this manner is not the same as being a shareholder through actual purchase of shares from the director’s own funds. It is unlikely that directors feel the pain as much as other shareholders if executive pay ends up being too high. The second factor is less obvious. When a company is saying goodbye to a long serving executive who is going into government service, particularly in a role that may impact the firm’s future prospects, does it really make sense to take a hard line on compensation? Or would it be better for the departing executive to have fond memories of the company as he takes on his new role? This influence need not be explicit. Again, the principle of reciprocity comes into play. If we are treated well by someone, we want to reciprocate. This is an innate human tendency that could afflict anyone (we are not casting aspersions on Mr. Cohn’s motives specifically). Ironically, while this potential motivation of the board is theoretically good for shareholders since they are “buying influence” that could pay off later, it is problematic from a public policy perspective. As citizens, we should want public servants who are qualified for the jobs that they are in and have an interest in serving the public. We should not want individuals who have limited options to serve in government, but rather seek out people who could earn a good income in the private sector. When a wealthy executive decides that he or she would like to work in government, ideally the motive should not be related to money. This is especially true for someone who is approaching retirement. However, we should not be so naive as to discount the possibility that a fat exit package and tax benefits do not play an important role. The public policy and corporate governance issues associated with this topic are important and deserve scrutiny. It is unfortunate that some media reports prefer to sensationalize the size of exit packages unfairly which ruins the credibility of the media. We should try to be as fair as possible when looking at exit packages and avoid conflating wealth and income earned over an executive’s career with the incremental value of what is being provided upon departure. Ultimately, both citizens and shareholders need to be alert to the implications of this topic and consider each situation on a case-by-case basis. Disclosure: Indirect ownership of Goldman Sachs via ownership of Berkshire Hathaway stock.